Duke Football takes on Virginia this Saturday in ACC action and here is what both coaches have to say before the match up. THE MODERATOR: We are now joined by Duke head coach David Cutcliffe. Coach, please make an opening statement and then we'll take questions. DAVID CUTCLIFFE: Playing a really, really, really good Virginia team. Coach Mendenhall and his staff do as good a job of coaching all three phases. They're as balanced a team as you'll play every year now. No secret to why they've won. Virginia is a talented team. Obviously on offense, the runningback, quarterback, receivers, tight ends, are all weapons. But certainly a quarterback that can beat you in multiple ways. Defensively they've got a lot of really good just football players, guys that can make plays. Thornhill does a great job just playing well. Talented athlete. So they pose a lot of problems. In the kicking game, they play extremely hard, extremely well. Our focus has been on Duke. We have to get better to be able to compete with them. We have to practice well to put ourselves in positions to be successful. With that I'll take any questions. Q. Another kind of general trending question for you. We've had four years of the College Football Playoff. 11 of the 16 spots have been occupied by four programs. Do you think that overwhelming majority among four programs is the result or the case of an unintended consequence in forming the Playoffs? Do you think it's a trend we should be concerned about? Do you think it should lead to more teams in the Playoffs? DAVID CUTCLIFFE: I would not ever push for more teams in the Playoffs. This isn't really a tournament sport. If you start trying to turn it into a tournament, it's not going to work. But the second thing, it certainly has been a trend. It's kind of happened that way throughout the history of college football, that the top teams over certain periods, certain eras kind of remain the top teams year in, year out. It's an indication of how well they're recruited, established program, emphasis of football in that community, so to speak. I don't know if you can do anything to change it. It's kind of what the free world is all about. You do see some outliers, but it's tough when you look at the talent level at certain programs, you got to really challenge yourselves as a program all around. I think you'll see some changes. It's kind of done that, where the power shifts. There's some programs right on that edge. That's what makes it special. I'll tell you where our tournament is, and this is where every team is held accountable, all of us, is that the regular season is our tournament. If you want to be in that dance, that really big dance, you got to play great all year long. That's a big part of our sport. It's why our regular season is one of the more healthy regular seasons in all of sport. Q. I had a chance to talk to Daniel Jones. He mentioned he hasn't played particularly well against Virginia in his previous outings. Why do you think that is? DAVID CUTCLIFFE: I think Virginia plays good defense. I don't think there's any other real reason. I've got to do a better job of having him prepared. Any time a player doesn't perform what they think is their best level, I always look at myself. Got to put our players in good positions to be successful. That's my job. Q. Your time coaching him, how has he developed in terms of teams he plays two or three times? Does he gain a better handle or understanding on what they're trying to do? DAVID CUTCLIFFE: I think every quarterback does that. You're fortunate when you have a guy that's a two, three, four year starter in your program. I think they all gain insight. He's really, really bright. What he's done is he's grown not just in any one opponent, his approach to preparation, his approach to studying team, his approach to how focused you have to be on practice, to being an owner on the practice field. I think the quarterback has to be an owner out there because everybody on that offense affects him. Sometimes when you don't play well, it's not all on you. But your responsibility is there. I think Daniel has done a better job of being a great practice player. That will serve him well as he continues to grow. Q. 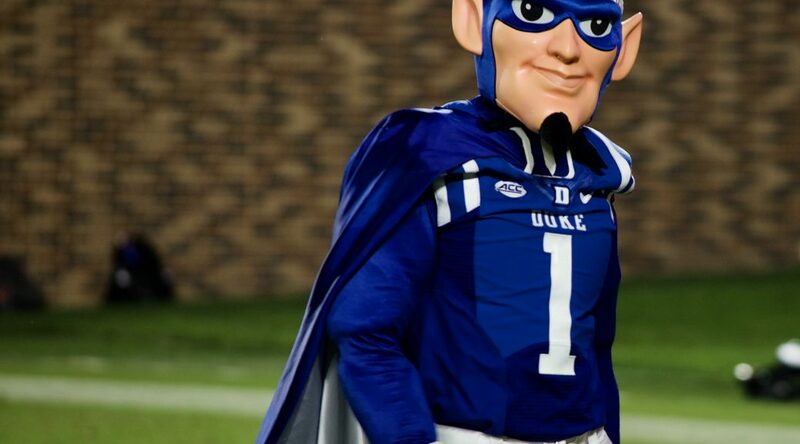 In looking at the ACC stats this week, it appears that Duke is in the top half of virtually every defensive category, which I guess hasn't been the reputation over the years. What do you feel proudest of your defense? DAVID CUTCLIFFE: I think it's been such a team effort. Ben Albert, Matt Guerrieri, Kirk Benedict, who is our special teams coordinator also work in the defensive staff, just been an emphasis of trying to make a team effort of getting better. Recruiting is better. Our commitment from our players, it's really a good focus. It's something we believe we can really build on. I don't think we've seen the best Duke defense yet. We're working very hard to continue to grow that. Q. Something about Georgia Tech's left guard, Parker Braun. I believe you recruited, saw him the other day. Tell me what you've seen in him in the game, on tape. 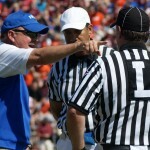 DAVID CUTCLIFFE: You want to talk about now or while we recruited him? Parker is an explosive guy, strong. Comes off the football, blocks the first level and the second level well. If I had to pick one thing about him, obviously I've watched him a lot in his career, not just this past week, is that his toughness and his tenacity. He competes hard. He stays after you the entire play, wire to wire. He's one of those guys that plays till the whistle blows. Q. Talk about Virginia's defense. They played a really good game against Miami. What do you have to do on the offensive side on Saturday afternoon? DAVID CUTCLIFFE: Bronco Mendenhall is one of the better defensive coaches I've known. We've known each other quite some time. I studied what they did when they were at BYU because I thought they were good the at what they do. I thought they were extremely well-respected for Miami. It almost seemed as if they were one step ahead of the entire game. They do a great mixture of their defenses, great blend of different types of things, different personnel, use their personnel well. I think you have to have a very focused offensive team. You have to have a team that can handle their versatility. You got to be proactive. If you become reactive to what Virginia is doing, you're going to be a step behind. You try to put your plan in, believe it. I think what they do for me is they make you prepare really, really, really hard. They got a lot to prepare for. We've tried to be focused in practice. But they require that you do that. I think they have a bunch of good football players. I mean, they're good athletes, but I'm talking about good football players that know what they're doing. They also have just a tremendous scheme. Q. What is it like coaching in a rivalry game that's dated back to 1890? DAVID CUTCLIFFE: Since I'm old and I was in the first one, it's really unique? I think I've been around for all of them, what I feel like sometimes (laughter). I think it's fun. Any rivalry game, I've been fortunate and blessed to be involved with a bunch of great rivalries. This is unique. It really is. I spent quite a bit of time off and on through the years up at Charlottesville before I was at Duke. It's a great university setting, as is Duke. I think it's a good rivalry again student bodies, not just teams, sports teams. BRONCO MENDENHALL: We're anxious to continue ACC play, this time going back on the road after a good performance by our team against Miami, and so we're hopeful to carry the momentum and improvement our program is making and carry is forward into our next game. So I'm glad to take questions. Q. You guys have handed to running backs 110 times this year, and 102 of those have gone to Jordan Ellis. I know you always talk about his conditioning, but how is he holding up and what kind of an impact do you need him to have in the second half of the season? BRONCO MENDENHALL: Yeah, he's holding up really well conditioning-wise. We just barely came off the practice field, and he just never seems to get hurt or tired. His conditioning, there's a reason that he's at the highest level in our strength and human performance categories and standards, and we need him to continue just as he is, all the way until the season is over. So that's what we're counting on. Q. Malcolm Cook, having him back, what does that do, and how has he looked so far in practice? BRONCO MENDENHALL: Yeah, Malcolm is returning to full health. He's not 100 percent recovered, but just having him available in that last game was critical, as we had an injury to Rob Snyder during the game, and so at an already thin position, it allowed us to at least manage and get through the game, and as he's returning to full health, it'll just keep getting better and better in terms of the impact he can have. Q. And is Snyder back and available now? Q. You mentioned Monday Coach Cutcliffe's reputation for coaching offense and teaching quarterbacks, but it seems that Duke's most marked improvement the last two years has been on the defensive side. As you have evaluated tape, what have you seen that they are doing so much better on that side of the ball? BRONCO MENDENHALL: Well, I like their scheme, first of all, so the position they're putting their players in I think is very good. They're coached very soundly fundamentally. They played with intensity and effort and aggression. But they're also poised and disciplined. I just think they're getting quality instruction, and their system now is allowing players that have been recruited to Duke to have their best chance for success, so I think the scheme matches their personnel, and they're coached really at a high level. I'm impressed from what I've seen, and acknowledging and liking great defense and good defense, I started paying attention when we came into the league, and I think they just keep getting better. Q. Statistically it's the linebackers who jump off the page. Giles-Harris and Humphries specifically. Are those the ones that jump off the tape? BRONCO MENDENHALL: Not necessarily. So they're strong and very productive, meaning that they're really consistent and they make lots and lots and lots of plays. But they're really just a component of the front seven and the collective 11, which just has players doing their jobs consistently and unified and coordinated at a really high level. But they're really good tacklers and they're active, and so I would say they're the leaders of the group, and certainly they're noticeable, but the collective 11 I think is the strength of the unit. Q. I've been getting a lot of questions about the sequence at the end of the game, taking the points off the board. I've been telling people it was to avoid a kickoff but I'm not sure. Have you done that before? Just kind of talk about that a little bit. BRONCO MENDENHALL: No, I haven't done it before. I've never had that exact situation. But pretty simply by taking points off the board, there wasn't going to be any more football, and we guaranteed the win. If we leave the points on the board, there's still time left and a chance to play the game, so by taking points off the board, it guaranteed our victory really with no risk, and so that's what I did and why. Q. Talk about Daniel Jones. You played against him last year down in Durham. What do you see getting ready for him this year? BRONCO MENDENHALL: Well, he's a quality quarterback with size and strength and intangibles, physical intangibles that come with strong production. He's being coached and has been developed by one of the best offensive minds and quarterback coaches that there is, and his play reflects it. So I think he's a very good player who's helped his team get to be 5-1, and that's really record, talks a lot about quarterback performance. I don't think you get to 5-1 without strong quarterback play, so I'm impressed. Q. I know a lot of coaches don't look ahead, but you guys beating Miami last week, you're basically still in the Coastal Division talk to go to Charlotte. Do you try to keep your players not thinking about that and try to get them focused on one game at a time? BRONCO MENDENHALL: Certainly. It's every team's goal to win their division and really at the halfway point there's very few teams that are eliminated from contention. The best chance to reach any of those goals is to play well the next week, which is where our focus is. BRONCO MENDENHALL: Nope, no, we're the same, so no difference from our game against Miami other than, again, Rob and Malcolm's status, which we just talked about. Q. Are there any takeaways from last season when you got off to a 5-1 start and struggled down the stretch? BRONCO MENDENHALL: Not necessarily. A few just key manifestations is ACC is long and grueling and difficult. It stresses roster depth and quality, and those two things really are manifest, so our roster is becoming deeper, but it's not significantly deeper. The ACC stretch is coming up, which is a huge test, and so really those things were the two key factors in our season. Q. A little bit of a touchy question. I understand the need for safety, but you're seeing a lot of defensive players being ejected for targeting, and they can't really change the angle when the running back changes their angle. Do you have any thoughts on that? BRONCO MENDENHALL: So you broke up there about halfway through the question, so I didn't hear the full question. Q. Does the NCAA need to change a little bit and look at time and space when we're talking about targeting? BRONCO MENDENHALL: Oh. Well, it's tough. There are hits that I think are ending up being targeting that I don't think are intentionally designed to be targeted by a defensive player, so there are some of those happening, and then there are certainly others that are clearly targeting, and everyone on the field and in the stadium knows that. I think it's still a work in progress. I still think it has possibilities to be improved. I'm talking about the rule for its intent, which is player safety. So I don't think it's perfect yet. QUARTERBACK – Anthony Brown, Boston College, So., Cliffwood, N.J.
Brown was efficient in leading the Boston College offense to a 38-20 win over Louisville • Threw his ACC-leading 14th touchdown pass of the season and finished the day 16-of-22 passing for 179 yards • The Eagles finished with 430 yards of total offense and scored 35-plus points for the fifth time this season • Brown picked up his second ACC Quarterback of the Week accolade of the year. RUNNING BACK – Michael Carter, North Carolina, So., TB, Navarre, Fla.
Carter rushed 18 times for a career-high 165 yards in Saturday night's 22-19 loss to visiting Virginia Tech • Carter, who averaged 9.2 yards per carry, also caught two passes for 19 yards. RECEIVER – T.J. Rahming, Duke, Sr., WR, Powder Springs, Ga.
Rahming caught four passes for 91 yards and a touchdown in Saturday’s 28-14 win at Georgia Tech • Touchdown catch came on third-and-12 from the Georgia Tech 48-yard line late in the third quarter and snapped a 7-7 tie • All four receptions resulted in Blue Devil first downs with yardage gains of 11, 12, 20 and 48 yards • Became the fourth player in Duke history to reach the 200-catch plateau for his career (now has 202). OFFENSIVE LINEMAN – Chris Lindstrom, Boston College, Sr., OT, Dudley, Mass. Lindstrom earned his second ACC Offensive Lineman of the Week honor of the season following his performance in a 38-20 win over Louisville • Was the top-graded lineman for Boston College, paving the way for an offense that totaled 251 yards on the ground as two backs went over 100 yards rushing (Ben Glines and David Bailey). DEFENSIVE LINEMAN – Zach Allen, Boston College, Sr., DE, New Canaan, Conn.
Allen was all over the field with seven tackles, including three for loss and a sack in Boston College’s 38-20 win over Louisville • The Eagles allowed a season-low 217 yards of total offense and held the Cardinals to 47 rushing yards on 32 attempts, the fewest rushing yards by a BC opponent in 2018 • The Eagles finished with seven sacks and 12 total tackles-for-loss in the win. LINEBACKER – Joe Giles-Harris, Duke, Jr., LB, Nyack, N.Y.
Giles-Harris registered a game-high 15 tackles in the Blue Devils’ 28-14 win at Georgia Tech • Helped Duke hold Georgia Tech to 229 rushing yards (144 below its season average) after the Yellow Jackets entered the weekend ranked first nationally in rushing offense (373.0) • Keyed an effort that held Georgia Tech to a season-low 14 points – 27.3 points below its season average entering the game. DEFENSIVE BACK – Juan Thornhill, Virginia, Sr., SS, Altavista, Va.
Thornhill also earned Walter Camp Defensive Player of the Week recognition for his performance in Saturday night’s 16-13 upset of No. 16 Miami • Made six tackles and intercepted two passes • Recorded 86 return yards on his two interceptions, including a career-long 62-yard return that set up a touchdown in the second • Second ACC Defensive Back of the Week honor this season for Thornhill, who now has 10 career interceptions. SPECIALIST – Maurice Ffrench, Pitt, Jr., KR, New Brunswick, N.J.
Ffrench opened the second half at No. 5 Notre Dame with a 99-yard kickoff return for a touchdown, staking the underdog Panthers to a 14-6 lead • It was the second kick return TD of the season for Ffrench, who had a 91-yarder for a score in the opener versus Albany • Became the first Pitt player to have multiple kick return touchdowns in a single season since All-American Quadree Henderson had a school-record three in 2016 • Ffrench is tied for the national lead in kickoff return TDs • The two-time ACC Specialist of the Week also leads the ACC and ranks second in the country with a 33.8-yard kickoff return average. ROOKIE – Chris Rumph II, Duke, R-Fr., DE, Gainesville, Fla. In his first career start, Rumph recorded four tackles – including four tackles for loss and a sack – in Saturday’s 28-14 win at Georgia Tech • Also had a fumble recovery with 2:41 left in the third quarter and the score tied at 7-7 to set up Duke’s go-ahead touchdown • Had two fourth-down tackles resulting in change of possession • Matched the Duke single-game record for TFL by a freshman. DAVID CUTCLIFFE: Yeah, we needed the open date, let a few people heal, hopefully enough to play in some cases. Absolutely realize we've got a very difficult task -- I think Georgia Tech is playing right now as well as anybody I've seen, period. You see where Coach Johnson has influenced this team from the start of the season until now, they've gotten better in all aspects. They're hitting on all cylinders on offense. Defensively you can tell they're more and more comfortable in their system, so they're doing more things, and their kicking game continues to improve. They've got weapons as specialists. This is a really good Georgia Tech team. We've got to get back on track. It feels like forever since we've played. Our players, I think, are anxious to get back playing, but certainly this is a huge challenge in Atlanta this weekend. Q. In your opinion, is it harder to get a team focused for the next game after a big win or a big loss? DAVID CUTCLIFFE: You know, it's a really good question. Unfortunately I've been around more big wins than I have big losses, but I've learned a little bit more about the losses as you go. I think sometimes the losses are depending upon the time of year. If you suffer a loss late that's pivotal to your season, I think it becomes very difficult to pick a team back up and refocus them. Do it a little earlier in the season, I think the loss sometimes fuels you where you're not dealing with the complacency. Win a big game early, I think you can be complacent. I have found, though, when you win big games at the end, they're meaningful. They propel you forward. So I think, again, it depends on the time of year. You get a team six, seven, eight games in that's winning and knows they're in a championship hunt, they can't wait to go back and practice. If you lose, I think probably in that same frame, it probably is much tougher. Q. Georgia Tech, offensively they're playing really well the last couple weeks and they've mentioned how they've simplified things, and I'm curious if you've seen that or anything else in terms of their real steep improvement in play the last two games? DAVID CUTCLIFFE: I think -- I don't know if you would call it simplified. I think they're executing what any option offense does really well. If you look at the balance, they certainly are having success running the fullback. Quarterbacks are running wild, but I think they're running the option all the way out real well. By simplifying it that means running a little more triple and arc, they're doing a good job of doing that. They've got other ways to get the ball on the perimeter, but when you -- their slotbacks or A backs are averaging 10 yards a carry. So that indicates that you're having a lot of success across the field. You see very much that they committed themselves to running their offense. Marshall is -- he's pretty slick, now. He's really great at running it, and you've got to honor the pass. That's the other part of it. You can stay simplified, but at any moment they're going to throw the ball and throw it well, and you're trying to limit the number of explosive plays that they can produce. But nobody seems to be doing that right now. It's pretty tough. Q. You mentioned Marshall. I know that he considered coming to Duke. What do you remember about your recruitment of him? 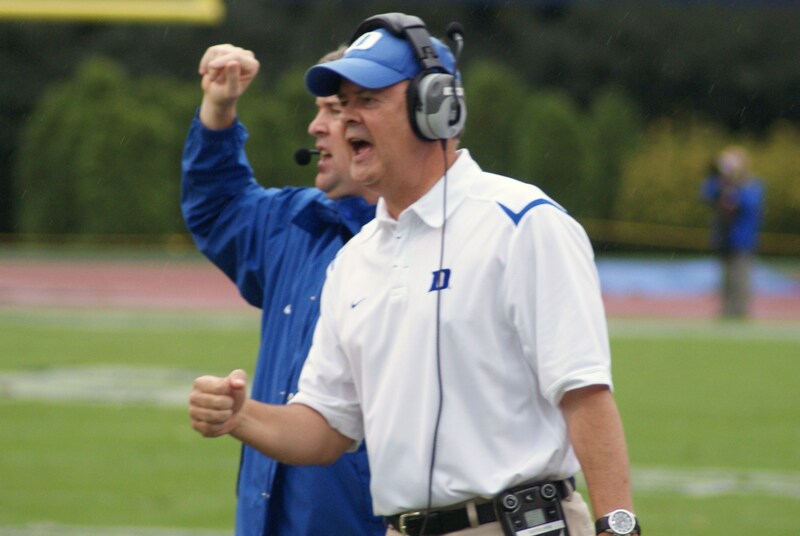 DAVID CUTCLIFFE: Well, he's just a great person. He's a great athlete. He's a fierce competitor. I like players that you can see on film that look like they want to -- they can't wait to play the next play, regardless of the result of the play, they get up and they go back. And I think that's his personality. That's why anybody would like to have him on their football team. He loves to compete. Q. How did you envision using him if he came to Duke? DAVID CUTCLIFFE: Well, he's obviously a great athlete, and he's not the prototypical size drop-back quarterback, but they've probably used a lot of players in a lot of different roles. But he's a guy that -- yeah, he can play quarterback. He's proven that every game. But he could also be a running back. He could be a slot receiver. He could be a DB. So I think when you sign a player like that, you're really not sure what to expect. You get them on your roster, but I promise you, you'll find lots of ways to use them. Q. In terms of your own offense, what improvement do you need to see coming off the Virginia Tech game? DAVID CUTCLIFFE: Well, you've got to produce explosive plays this day and time to get your points per game up. We didn't do that against Virginia Tech. It was the first time this year we didn't produce it. We had chances, and we missed them. Close calls are not what we're hunting. We've got to execute better when we throw the ball down the field. We've got to block not only up front better but you've got to block the second and third level better to create explosive plays in the run game. We've got to continue to take care of the football, and one of the things you've got to do to play good offense is keep the change normal. You can't have sacks, and we gave up three of those last week. You can't give up tackles for losses. You don't want to get behind the chains. So really we've worked very hard over the open date at just our general consistency and just extreme execution of what we're doing. So hopefully that hard work pays off, but regardless of what you do on the practice field, you've got to make it happen on Saturday, and that's going to be a real test. Q. Especially given the popularity of RPOs in college football today, I'm curious about your thoughts on the ineligible receiver downfield rule. 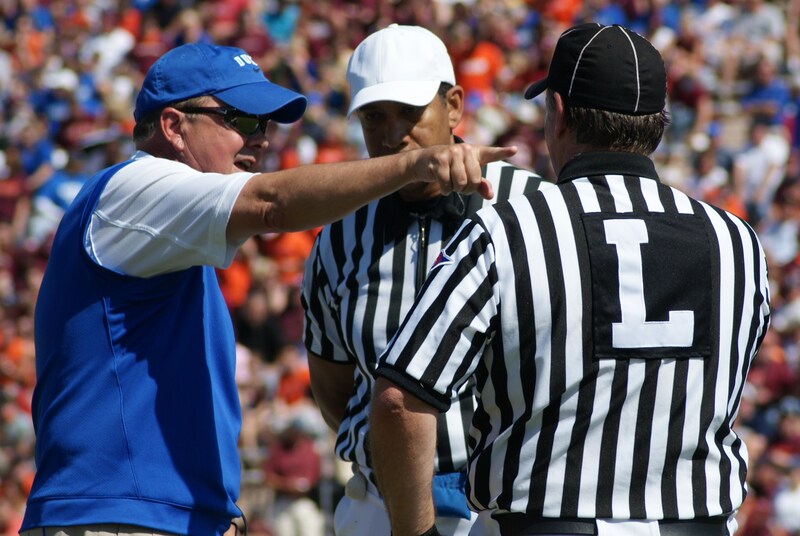 DAVID CUTCLIFFE: I think first thing everybody has got to represent, there are two types of RPOs. Where it first lived, it can be a legal play. You're throwing a bubble or a screen outside behind the line of scrimmage, and those things, linemen can be downfield. Then officials have to do a great job of seeing where the ball was caught. Often in the bold days you would see a flag go down and then they would have to pick it up. As far as the throws that go downfield, people are throwing slants and quick outs, and it's very difficult for the officials to officiate it right now. Whether you give it no leeway or two or three yards' leeway -- we've had it called on us once this year, and it should have been called. We had a lineman that went downfield, and the play was not designed for him to release, and he did, and we threw it, and they caught it. So I think the officials are trying to do a great job of it. Whether it's three yards, two yards, whatever you choose to do, you just have to enforce it. The other thing that gets really difficult is whose call is that. The guys on the side are moving downfield as the play develops. The umpire is trying to survive. I don't know if a referee and a center judge can see it. So it's a pretty complex question. But what you want is you just want fairness. You want something that can be uniformly called. I do think it's difficult on the defense. But I also think it is a weapon that you can use offensively if you use it properly. So I just -- if we look at the rule, and I think we have to continue to look at it, we just have to make sure it is something that we can actually officiate. We've got some other things going on, I think, that I wouldn't want to be an official trying to figure out what blocking below the waist was right now. If you get in that rule book and read it, you can't call it. It's very difficult. Probably the only aspect of it that you can call, in that case, is that it can't happen five yards beyond the line of scrimmage. I'm using that as an example because I think you've got to be careful with these rules and make sure that it's something that the officials can execute. I know that's a long answer, but it's a very complex question that you asked right now in football. PAUL JOHNSON: Good morning. We're looking forward to being back home and having a chance to play a really good Duke team. I think that Coach Cut has done a really nice job there. They're really, really good defensively. They run to the ball, play hard, and when they have their quarterback in there, they present a lot of problems offensively, as well. Q. Coming off the offensive performances and the wins the last couple weeks, obviously the opponents haven't been South Florida or Clemson, but what can you discern from what the improvement has been in terms of your offense versus maybe the caliber of the opponent you're playing? PAUL JOHNSON: Well, I think Clemson is Clemson. You mentioned South Florida. We had 600 yards on South Florida and 38 points. We just didn't get enough to win the game. You know, I think we've played better, we're executing at a little higher level, and it'll be a challenge this week. This will be the best defense we've played for sure since Clemson, and they're really good in their own right. Q. What have you liked about Marshall's play in recent weeks? PAUL JOHNSON: I think he's limited his mistakes and played within the system, and he's got good ability. He's quick, and he's made good decisions, and when we play with no turnovers and no penalties, we can be pretty effective. Q. I've heard some of your colleagues say that they sleep better during seasons in which they're pretty confident that they have a quality backup quarterback. Does Tobias give you that comfort? PAUL JOHNSON: Yeah, he's a good player. He's played well every time we've asked him to go in, and I think he's just going to continue to get better and better the more he plays. I feel good about both those guys, absolutely. Q. Just to follow up what you said about Duke, when you look at them on film, what impresses you that has made you impressed with them? PAUL JOHNSON: Well, I think their talent level has gotten better each year. Certainly their two linebackers, really they've got three linebackers that are all good players. The Harris kid and the Humphries kid have been playing for a long time. They've played against us a bunch. I think that their team speed is much better. They've got guys up front that can get pressure on the quarterback without having to blitz, and it just looks like when you watch them play, they understand their scheme, and they play fast, which is what you want with a defense. Q. You mentioned the guys from Duke who have played a long time. So, too, has Parker Braun played for you. How has he improved specifically this season and perhaps even bringing leadership to that line given his experience? PAUL JOHNSON: Well, I think the biggest thing, he's just a year older and stronger. He's always been a pretty good player. He has to play within himself sometimes. He gets a little outside because he likes to compete so much. But you know, he's got a good skill set, and he's tough. He's fearless, and he likes to play the game. I think the longer he plays, the more he becomes aware of defenses and understanding what they're trying to do and all those kind of things, and he's been a really good player for us ever since he played as a freshman really. Q. You mentioned getting outside of himself; how does that manifest during a game? PAUL JOHNSON: Well, what I'm talking about about that is he may go after -- he gets in his mindset he's trying to get somebody and he becomes too physical or too out of control. When he plays within himself and plays in control, he's really good. He just can't allow himself to get out of control. He plays nasty. That's a better way to put it. He gets after you. Q. Where do you feel like your defense has made improvements over the last couple weeks? PAUL JOHNSON: I think we're getting better. I think the kids are starting to understand a little bit. We've had some issues on 3rd down, and that's something we're trying to work hard on. I think that that's right now the biggest issue over there, still having too many missed assignments. But I think the more they play, the better they're going to get. So we've got a lot of young guys over there, and I think we're finally starting to get to the point where we're kind of settled on who we want to play with, and I expect that they're going to get better as we finish it out, and certainly they're going to have to. Q. Talk about Daniel Jones from Duke, talk about his development, how he's played the last couple years. Does he look like he's much improved this year? I know he's coming off an injury. PAUL JOHNSON: Right. I thought he played well last year. He's a good player. He's got good size. He's a dual-threat guy. He can hurt you running the ball as well as throwing the ball. I think probably the thing that's most impressive with him is he doesn't usually make mistakes. I think he understands what he's doing. He understands defenses, and he operates their system at a high level. I think he's a really good player. Q. Talk about last week when you guys played Louisville. What did you like about your team? You played on a Friday night. Do you feel like your team is finally making that turn to finally go in a positive direction? PAUL JOHNSON: Well, I think we've played better the last two weeks, especially offensively. But I thought we got off to a good start. Defensively we got a couple turnovers and were able to capitalize and get ahead in the game, and as well as we were playing on offense, once we got up 21-0, they were going to have a hard time catching up because we weren't missing a turn. It was a good way to start the game, and hopefully we can continue to get better and continue to execute at a high level the way we have the last two weeks. Certainly the defense this week will be a little better. The Duke football team suffered their first loss of the season last evening, where Virginia Tech came away with a 31-14 victory. Despite the disappointment, the Blue Devils still have a lot to play for and I will break that down while adding some perspective. Duke goes into their bye week of the season 4-1 and how many would have gladly taken that record at the beginning of the season? 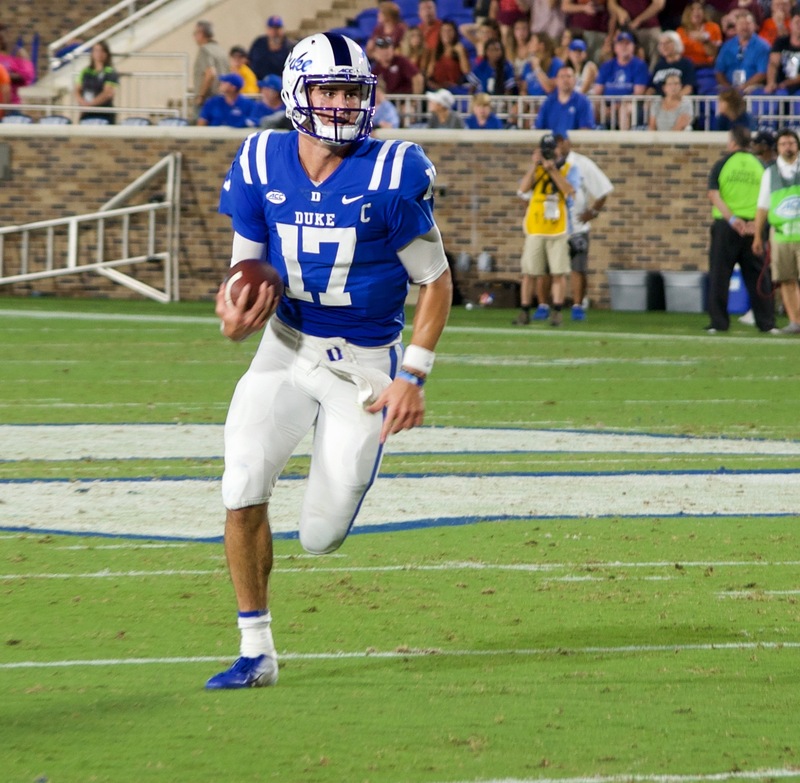 The Blue Devils played two games without starting quarterback Daniel Jones and every game without multiple starters yet have positioned themselves two wins from bowl eligibility. The Blue Devils did not play their A-game and Virginia Tech defensive coordinator Bud Foster had a masterful plan against Duke. He kept the Hokies in mass deep zone coverage keeping everything in front of him. In other words, he dropped eight players which took away the long ball while allowing his front to get to the quarterback. Duke also lost the turnover battle, not to mention a key call where the Hokie ball carrier appeared to be short of a first down via his knee touching. Of course, the defense while playing well for Duke created no turnovers and that happened for the last eight quarters of football. Still, these things are correctable and with a few different outcomes on key plays and Duke would have been much closer to winning the game. First, the bad news in that running back Marvin Hubbard is out for the season after rupturing his Achilles tendon. That takes a toll on backfield depth. 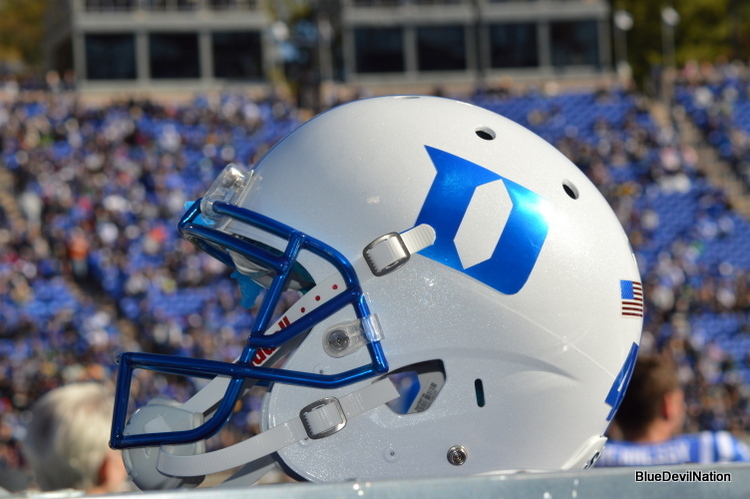 But in with the off week at hand, Duke will be allowed healing time for players injuries. 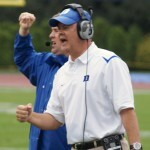 The Blue Devils will be much healthier when they get back to action against Georgia Tech. The key quote from Cutcliffe says it all, "We will win out share if we keep our fight." He was talking about the upcoming games on the ACC schedule and he was referring to how important it is for the team to remain hungry and play with more of an edge than they did in their loss. A season ago, Duke went on a tailspin losing streak after going 4-0. No games in the ACC are a gimme, so the most important game is without a doubt the matchup with Georgia Tech for a win puts the thought of a drought out of peoples minds. Many fans were disappointed with last evenings loss. Duke had a chance to remain in the top 25 for a few weeks and go for the Coastal Division crown. Duke will now play for a good bowl game in that they still have road games with Miami and Clemson, making a division crown a tough get. But this team is capable of playing in a good bowl game against a good team. And they should get up off the mat after not showing up in the way they wanted to on national television. You know how far the program has come when fans are in angst over losses and demanding more. Before Cutcliffe came to Durham, catching wins were akin to a tortoise getting across the street before a car came by on US Highway 15-501. 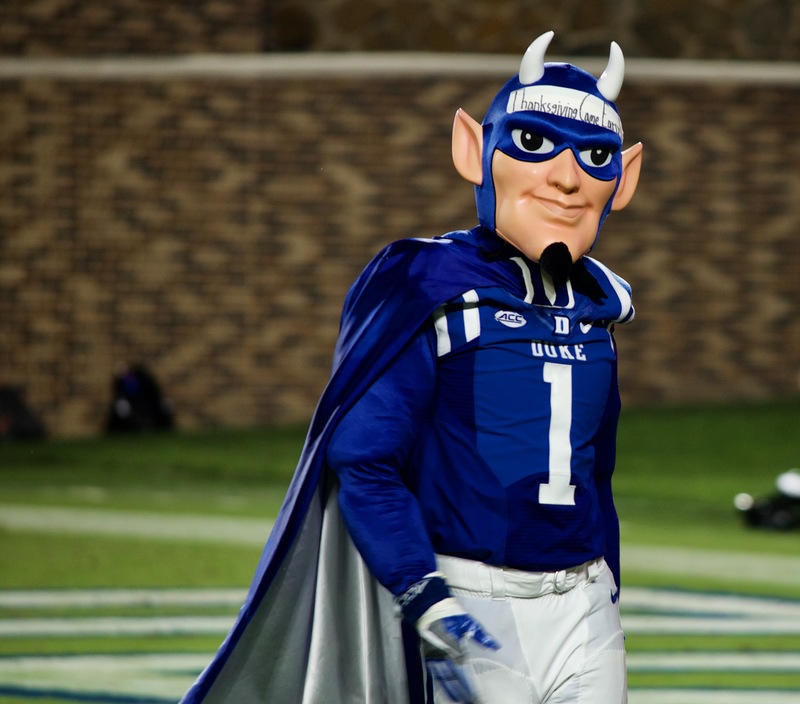 Duke should be going bowling for the fifth time in six seasons and that was once unheard of. The program is in pretty good shape and I feel the team may take this last loss personally. Only time will tell, but Duke can position itself to play in a top-notch bowl game against a power five foe. But to do so, they have to take it one game at a time and simply improve in the off week. Duke had a golden opportunity to go 1-0 in the ACC and remain undefeated and ranked in the top 25, but a fired up Hokie team spoiled the party. The Blue Devils could not get things going offensively until late in the game despite the return of Daniel Jones and that made for a frustrating evening. When the dust cleared, Duke was on the short end of a 31-17 score. Virginia Tech quarterback Ryan Willis exploited the Duke secondary early and often and ended the game 331 yards passing including 3 touchdowns. Big plays haunted Duke which included a 67-yard touchdown pass which made the score 17-7 going into the half. 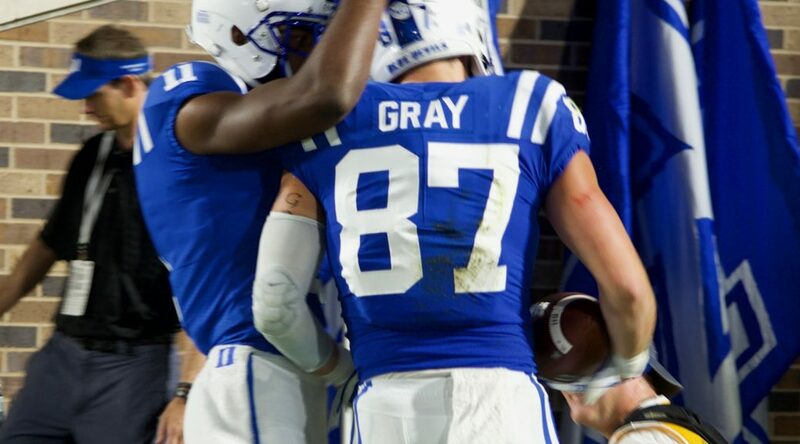 Duke took a 7-3 lead early in the game on a 23-yard touchdown pass from Jones to Noah Gray, but everything started to go wrong from there. Jones suffered his first interception of the season which led to a score as well. And Duke was stuffed at midfield when they went for it in an effort to get back into the game. Meanwhile, the Hokies seemed focussed not turning the ball over and scoring each time they were in the red zone in the first half. Jones would end the game with 226 yards passing, one for a score. Duke wound up with 327 yards of offense with 18 first downs to the Hokies 413 yards a 17 first downs. The difference being big plays which helped to Hokies to a 3-1 record on the season. Duke will try to regroup with a bye week coming before they travel to Atlanta to take on Georgia Tech. A season ago, Duke went on a vicious losing streak after a 4-0 start and the emphasis for the team will be to prove they're better prepared for adversity this go round.